47% of businesses have been affected by financial crime within the last 12 months. This is one of the key statistics that caught attention at the 2019 edition of the Center for Financial Professionals (CEFPRO) Fraud and Financial Crime Europe conference. There was plenty on the bill in London earlier this month (2-3 April), as professionals from across the industry got together to hear about and discuss the latest issues affecting businesses. 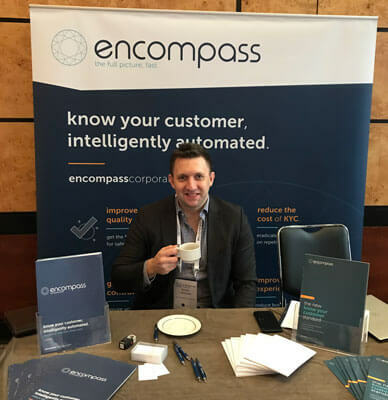 With encompass acting as an Associate Sponsor, and Senior Product Manager Robyn Todd joining a panel to discuss the potential uses of technology – including Artificial Intelligence (AI) and Machine Learning (ML) – to automate and increase fraud and Anti-Money Laundering (AML) detection, it was an important event on our calendar as we had the chance to connect with key players across the space. One of the most relevant pieces of information I took away from the conference was that $1.47tn is the total sum of money lost to financial crime globally, which is 5% of global GDP. Perhaps even more impactful is the fact that if this was a country then it would be the 15th biggest country in the world in terms of GDP. These stark figures show just how much the problem is costing us as a society and only underlines the need to increase our efforts in the fight to tackle the issue – it is more important now than ever before. In this vein, we also delved into the psychology of fraud. The main conclusion from this is that a large proportion of the population would commit small “frauds” if they could get away with it and then rationalise it to themselves that they weren’t doing anything wrong – such as claiming for slightly more on expenses or not following compliance rules in the right way and thinking that the regulator doesn’t understand their business so they don’t have to apply the rules in the same way. It is also worth noting that any movement of any funds from fraudulent activity can be deemed to be money laundering and therefore it is important that banks are able to enforce their compliance policies consistently across the organisation. It has to be said that most banks were surprised by the speed at which the 5th Money Laundering Directive (5MLD) needs to be implemented. The majority haven’t finished putting the particulars of 4MLD into operation yet. With 6MLD also not far behind, the need to run fast(er) is becoming more apparent. 5MLD is something that is approaching and must be taken seriously, so these concerns emphasise the fact that there is work to be done in order to ensure that firms are compliant and it is a top priority right through the sector. It is for these reasons that firms may find themselves turning to regtech providers. Combining AI and traditional data sources is becoming more pertinent and, with encompass, it is possible to dynamically build a visual picture of a company or individual in just minutes. When looking back at the event as a whole, it was very interesting and worthwhile hearing from industry experts on the outlook for the financial services industry regarding compliance and financial crime and how they are looking to embrace technology and AI to meet these challenges. encompass has the opportunity to work with our clients and partners to help them implement IPA into their KYC processes to reduce onboarding times, ensure policies are followed consistently and improve client experience, and it is one that we must embrace.